The 10th Presidents Cup gets underway on Thursday, as the best players from the United States take on the best International players that excludes Europe. No, it’s not a boycott against Europe, the U.S. and Europe have their own biennial event that you might have heard of called the Ryder Cup. But the Presidents Cup and Ryder Cup take on very similar format, as team play is at the heart of the competition before getting going with singles matches on the final day. The U.S. has a much better record in the Presidents Cup than they do in the Ryder Cup. In fact, the United states has lost just one time to the International team, which came back in 1998. The U.S. is 7-1-1 in nine previous Presidents Cups. On paper, the United States team is favored to win over the International team once again. Team USA is going off as 1 to 3 favorites to win, while the International team is set at 5 to 2 on the betting line at Bovada Sportsbook. The United States has six of the top-10 players in the world on their team, so there is good reason for them to be confident. This includes the No.1 ranked player in the world in Tiger Woods. Other notables include Phil Mickelson, Steve Stricker, Matt Kuchar, and 20-year-old Captain’s pick Jordan Spieth. Fred Couples is the U.S. Captain. For the International team it’s Nick Price who is the captain. Price’s team includes Adam Scott, Ernie Els, and Jason Day. 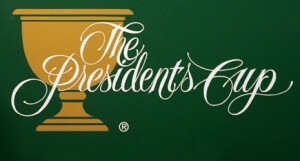 The 2013 Presidents Cup will be contested from Muirfield in Ohio, the Jack Nicklaus course that host the World Golf Championships event each year. The pairings for the first day of competition will be announced at 1pm ET on Wednesday. The first three days of competition will include foursome alternate shots, four ball matches, a combination on Saturday, and then singles matches on Sunday. All 12 players will play every day, which is different than the Ryder Cup. Golf Channel and NBC will combine for the coverage over the course of the four days, bringing all of the golf action live. This entry was posted in News, PGA Tour Betting Odds and tagged 2013 presidents cup, 2013 presidents cup odds, adam scott, ernie els, phil mickelson, ryder cup, tiger woods on October 2, 2013 by Bryan.